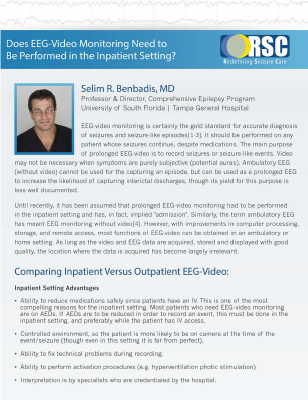 Does Video EEG Monitoring Need to Be Performed in the Inpatient Setting? - Selim Benbadis, M.D. EEG-video monitoring now has the option of being both inpatient and outpatient—find out the pros and cons of each with this review. In-Home Video EEG Helps Diagnose Sleep Related Seizures - Thomas O. Pearson, M.D. 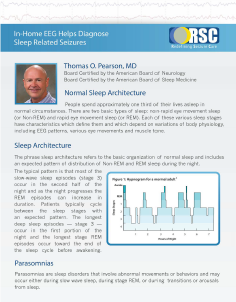 Find out how in-home video EEG helps patients with parasomnias and sleep related disorders find both a proper diagnosis and peaceful sleep. 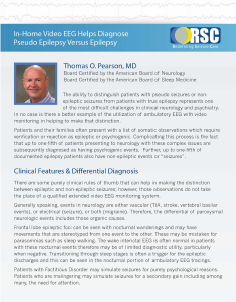 In-Home Video EEG Helps to Diagnose Non-Epileptic Events vs Epilepsy - Thomas Pearson, M.D. 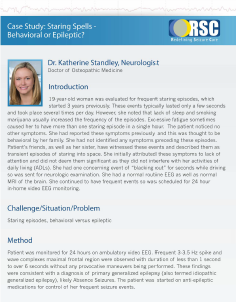 Diagnosing non-epileptic spells versus epilepsy is a huge challenge in neurology, and this case study shows in-home video EEG is a reliable solution. 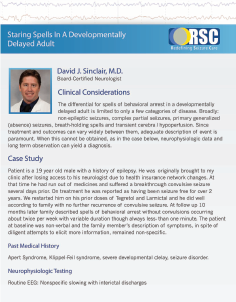 Staring Spells in Developmentally Delayed Adult - David J. Sinclair, M.D. RSC’s Case Study shows how AEEG can help diagnose spells in developmentally delayed adults who can’t communicate their symptoms well. Making the Diagnosis in Frontal Supplementary Motor Area Seizures with Video Capture of Seizure Semiology - David J. Sinclair, M.D. In-home ambulatory video EEG has revolutionized the way doctors diagnose frontal lobe seizures; find out how with our case study! 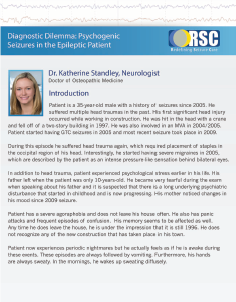 Psychogenic Seizures in the Epileptic Patient - Katherine Standley, M.D. Find out through this case study how AEEG helped diagnose a patient with similar psychogenic and epileptic symptoms. 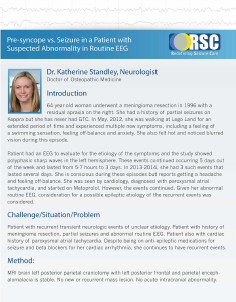 Pre-syncope vs Seizure in a Patient with Suspected Abnormality in Routine EEG - Katherine Standley, M.D. The combination of routine EEG resources is what led to this patient’s treatment. Read our case study to learn more! 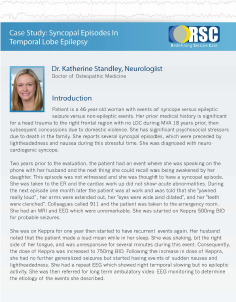 Syncopal Episodes in Temporal Lobe Epilepsy - Katherine Standley, M.D. 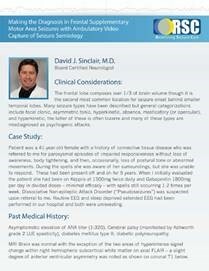 See how this 46-year-old patient’s long term syncope was diagnosed using an extended ambulatory video EEG. 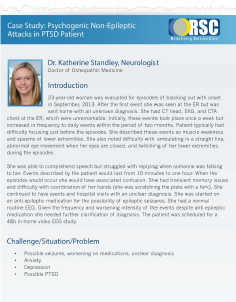 Psychogenic Non-Epileptic Attacks in PTSD Patients - Katherine Standley, M.D. One patient experienced non-epileptic attacks, and a 48 hour in-home video EEG study showed a clear diagnosis when other hospital scans could not. Staring Spells – Behavioral or Epileptic? - Katherine Standley, M.D. The patient’s staring spells were more than a simple habit; this was proven by the 24 hour in-home video EEG monitoring, and the provided case study. 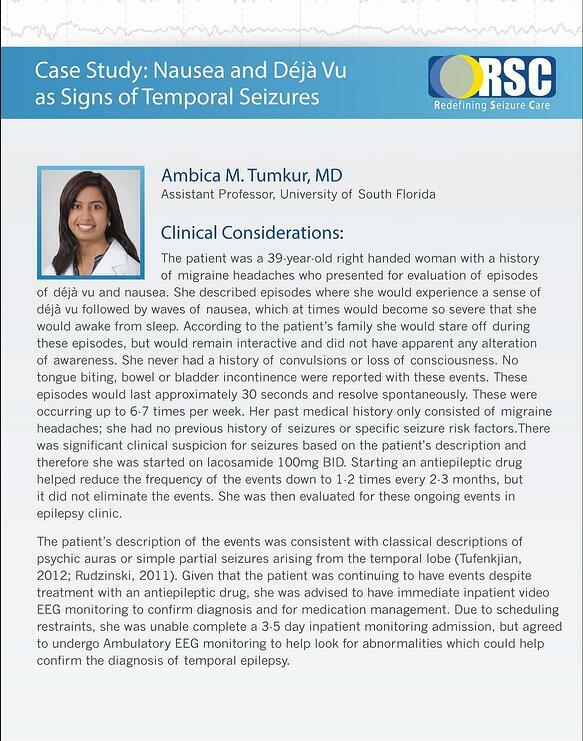 Nausea and Deja Vu as Signs of Temporal Seizures - Ambica Tumkur, M.D. Learn how an in-home EEG justified the order of an MRI which revealed a lesion in the right temporal region in this 39-year-old woman with no history of seizures.